2015 is a double witching year for Chicago property taxes. First you have the triennial (once every 3 years) property reassessment going on, which can have a significant impact on individual property taxes. Then you also have this whole $543 MM property tax increase that just got approved and that will possibly impact everyone's property taxes. At least I think the property tax increase will go into effect for 2015 property taxes, which are paid in 2016. I can't be 100% sure because there is a bit of frustrating ambiguity in the reporting on this topic with references to "now" and "2016". However, some of the better articles on this subject reference numbers that suggest we are in fact talking about the 2015 property taxes and how they will affect the city's 2016 budget. So you have to be extra careful this year and next if you are buying or selling real estate in the city. The reason for the extra caution is that when real estate transfers ownership the seller is responsible for the property taxes through the closing date but those taxes will not be known or paid until some time in 2016 - or even 2017 for deals closing in 2016. Normally the buyer and the seller estimate those taxes based upon the assumption that the tax bill for the entire year will be 105 - 110% of the previous year's tax bill. However, this double witching could result in property taxes going up by much more than 110% - especially if Rahm Emanuel is able to push through his populist, vote buying exemption for homes valued under $250,000. 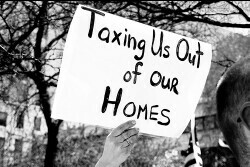 That would force more of the tax increase burden onto homes valued above $250,000. And there's actually another wrinkle hanging out there. Supposedly Mayor Emanuel is looking to the state legislature to double the homeowner's exemption, which would shift more of the tax increase burden to investors and commercial property owners - more pandering to voters. Just to give you an idea of how bad it can get I estimate that my own property taxes will be going up by 40% next year. Because it would be too complicated for me to factor in the impact that's before considering the result of shifting the burden to higher valued homes and increasing the homeowner's exemption. If your realtor understands all this they are going to want to take all these factors into account when considering the proration factor on any property sales contract, and of course the buyer's agent is going to want the proration factor to be as high as possible while the listing agent is going to want that factor to be as low as possible. And this is where things get sticky because not many realtors understand all these nuances. In fact, every time I represent a buyer and I use a proration factor above 110% I get some serious push back accompanied by some pretty lame arguments: "You don't know that the property taxes are going up!" Well, yes I do because if the assessed value goes up by 30% then the property taxes are basically going up by 30%. Or "This township is different because _______". You get the idea. You can negotiate that same flat percentage but then agree that the seller will be responsible for any shortfalls. Keep in mind though that the buyer will have to hunt down the seller to collect on this deal. You can agree to put a large enough amount in escrow to cover the outer limits of what the buyer thinks the property taxes might be and then after the actual property tax bill comes out you refund the difference to the seller. Which of these three options you choose will depend upon the way the negotiation goes between the two parties and often this issue gets deferred to the attorneys (because it's assumed that they will understand this better than the realtors but in reality they might be just as clueless). You should just be sure that your own agent understands this issue so that they can at least get the issue out on the table before a contract is agreed upon in principal. Sometimes the impact is only a few hundred dollars but it can run into the thousands. Gary Lucido is the President of Lucid Realty, the Chicago area's full service discount real estate brokerage. If you want to keep up to date on the Chicago real estate market, get an insider's view of the seamy underbelly of the real estate industry, or you just think he's the next Kurt Vonnegut you can Subscribe to Getting Real by Email. Please be sure to verify your email address when you receive the verification notice.